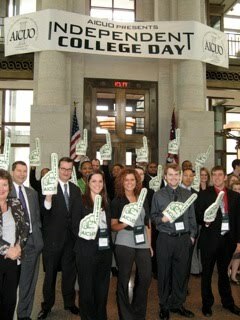 Today more than 45 students from the University of Dayton, Baldwin-Wallace College, University of Rio Grande, Capital University, Wittenberg University, and Wilberforce University attended the first of two 2011 AICUO Independent College Days to advocate on behalf of their institutions and meet with legislators and staff. The event started with an Education Committee breakout session hosted by Senate Education Committee Chair, Senator Peggy Lehner (R – Kettering), and included unique display tables for the students and advisors to showcase their institutions as legislators and staff perused the tables and discussed policy and Ohio higher education with attending students. The students were also able to tour the Senate and House chambers, watch Senate skeleton-session in progress, as well as view committee rooms and other aspects of the historical building. Legislators were able to hear real-life stories about how need-based aid affects students and how important it is for them to remain in college; without it, many students would have to reconsider their educational path. Independent College Day will return to the Statehouse on March 31, 2011 with more than 10 campuses already signed up to participate.